Despite his reputation as the "world's worst poet" McGonagall's poems are nowadays read, quoted and enjoyed more than ever, although perhaps because they offer more amusement than insight. McGonagall's parents came from Ireland but they moved to Scotland where McGonagall was born in Edinburgh in 1830, or thereabouts (some sources give 1825). 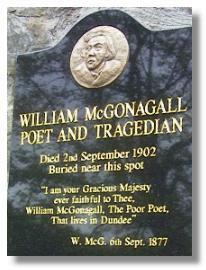 McGonagall's father was a hand-loom weaver and the family moved to Paisley, then Glasgow, before settling in Dundee. Due to lack of money, William's education lasted only eighteen months but that was enough to start him onto reading and then writing. Although he trained as a hand-loom weaver like his father he, had a brief career on the stage - as Macbeth. But, as McGonagall himself said, "The most startling incident in my life was the time I discovered myself to be a poet, which was in the year 1877." He became a well-known public figure and toured Scotland giving performances of his poetry and selling copies of his poems. The fact that his audience was more amused than impressed did not seem to perturb him. He had a brief and disappointing trip to New York in 1877 but a selection of his poems were published under the title "Poetic Gems" in 1890. The Willam Topaz McGonagall Web site has examples of his work - and his own hilarious auto-biography.